Is it a Singapore thing? Was it deliberate or is it mere coincidence that a number of the artist performances that have been lined up for the opening weekend of the Singapore Biennale 2016 involve food and/or eating? But more on this in a bit. We at Plural were pleasantly surprised to receive invitations to the media preview for the Biennale at the Singapore Art Museum on Tuesday and it certainly did not disappoint. In the days and weeks to come, we look forward to checking out the various exhibitions and artworks that are being offered up at the Biennale and giving you our own personal take on them here. For starters, here’s a rundown of some of the performances and events that are happening from today, Thursday 27 October, through till Sunday 30 October, for the opening weekend of the Biennale. We thought we’d put a rush on it and get this out quickly so that you’ll be able to catch some or all of them this weekend, if you’d like. One of the edibles that is being incorporated into performance art at the Biennale is the humble leek. Malaysian artist Chia Chuyia, whose more recent work reflects her concerns about the environment and the future of food, proffers a durational performance at SAM at 8Q in which she slowly knits a full-length garment out of long strands of … yes, leek! Over a period of 5 weeks, the result of this laborious endeavour will be “a suit to protect the body from an unknown future”. According to the artist, the human body is “land that needs to be taken care of” and, by protecting the body, she is protecting the land through this performance. Here is the artist, knitting strands of leek in her performance work, Knitting the Future, 2015, 2016. But, why leek, you might well ask? For the Chinese, it is traditional to eat leeks during the Lunar New Year because the word for leek, suan (蒜), sounds similar to the word ‘to count’ (算) and there is a saying that if one eats leek, there will be money to keep. Chia, who now lives in Sweden, is part of the Chinese diaspora. Knitting the Future is her way of recalling the rituals of food preparation of the past and suggests that, perhaps, our future lies in our past. You can catch her knitting away, surrounded by her balls of leek, in the Glass Box at SAM at 8Q every day from today till Sunday, between 12 noon and 6:30pm. Fancy a bite of juicy mango? You might get lucky if you show up at the Plaza of SAM at 8Q on Friday 28 October from 6:00pm to 6:45pm. Another Malaysian artist, Niranjan Rajah, will be serving them up in a performance, which is a component of his installation, Koboi Balik Lagi (The ‘Koboi’ Returns Again). The other components consist of two chromogenic prints and 12 lightbox images – and you can read more about these here. Together, the installation is an exploration by the artist of personal and family narratives, as well as the cultural, political and social landscapes of his homeland. In his performance, the artist recounts the Hindu myth about how Ganesha wins a mango (Ganesha and mango, pictured above) in a contest with his brother Muruga, by circling his parents three times. While telling the tale, Rajah will peel, slice and serve a mango to the audience. or, read the artist’s own family memories of the Mango Myth here. Looking at art can be thirsty work. If you need a drink, you might be able to get one at the Putar Alam Cafe at SAM at 8Q Plaza. You won’t even need to bring your wallet as the currency accepted here isn’t cash, but conversation. Malaysian artist Azizan Paiman presents his site-specific installation as an interactive space in which he will act as both bartender and mediator. 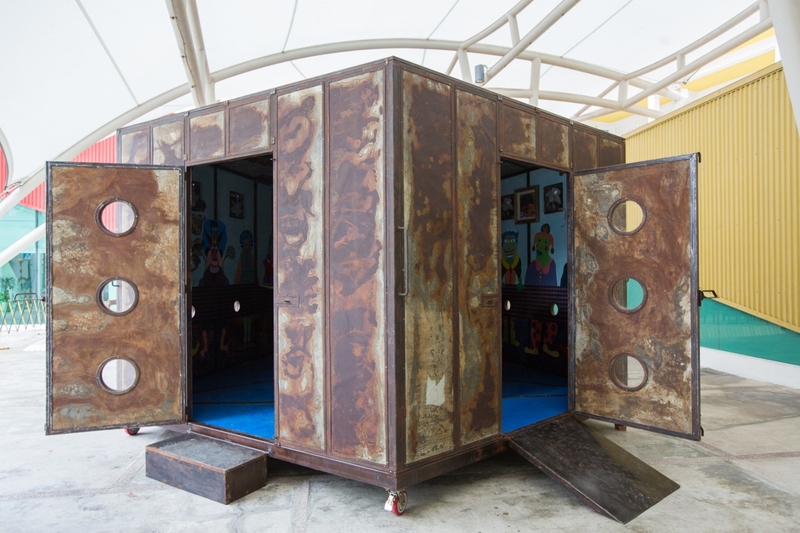 At specific times over Saturday and Sunday (10am – 11:30am, 1pm – 2:30pm and 4pm – 5:30pm), he will serve food and drinks to the “customers” while managing and mediating conversations and debates among them, which he will record and play back for the duration of the Biennale. Likening the cafe to the pub in the TV series Cheers, Azizan’s intention is to provide an open and democratic space to discuss the issues of the day. The interior of the cafe is equipped with a transistor radio, a television broadcasting a news channel, as well as recent works by the artist. The information heard over the radio or news stories seen on television may provide a starting point for conversation. Visitors may also respond to the images of his artworks. Putar alam is a Malay word, which means charlatan, and the work is intended by the artist to serve as a social experiment exploring how the media, possibly the greatest charlatan of them all, may influence our perception and understanding of things around us. There will be plenty of other options by way of food and drink this Sunday at SAM’s Glass Hall and courtyard, when The Local People’s Art Market takes over the space. You can also browse and buy art, crafts and other retail offerings at the many participating stalls and booths. Other artist performances taking place over the Opening Weekend include Kra-Tua Taeng Seua (A Tiger Hunt) by Sakarin Krue-On and performers; live choral performances by the Anglo-Chinese Junior College Alumni Choir of artist Jack Tan’s Hearings; as well as a poetry recital by Bangladeshi migrant workers, as part of artist Rathin Barman’s work Home, and a Home. Check out the times and venues of the performances here. Have an art-filled and fun weekend!